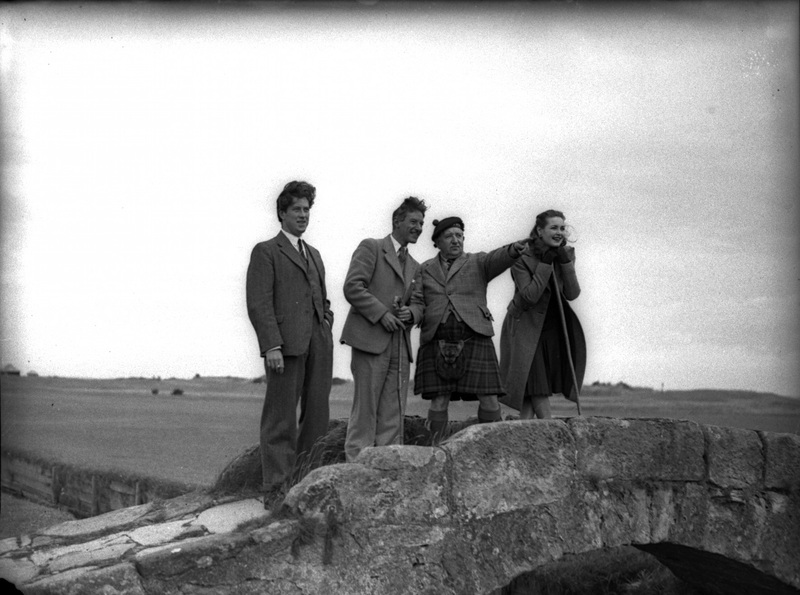 Patricia Roc touring the Old Course with her Scottish co-star Will Fyffe as her guide. Taken from ‘Scots Accent Beat Film Star’. Dundee Courier. July 30, 1946. 3. In 1946, the English actress Patricia Roc visited St Andrews twice to generate publicity for The Brothers (David MacDonald/ U.K. / 1947), a film set in Scotland and targeted at Scottish audiences. These visits constituted unique occurrences in the town’s history of star appearances, helping to identify, associate and position this English actress within Scottish culture. Although not widely remembered today, Patricia Roc was well known in the 1940s for her roles in English historical melodramas like The Wicked Lady (Leslie Arliss/ U.K. / 1945). British audiences even voted her their third favourite film star in the 1946 Daily Mail National Film awards (De Lafayette , 2011, 21). On July 29, 1946, Patricia Roc came to St Andrews to visit her co-star in The Brothers, famous Scottish comedian Will Fyffe, who lived in the town (The Citizen, 3 August 1946, 3). Roc received a tour from the kilt bedecked Fyffe and they posed for press photographs on the Old Course and throughout the town. She discussed her first trip to Scotland with the local newspapers, stating ‘the people I have met have been most charming; I shall certainly be delighted to come back’ (Dundee Courier. July 30, 1946. 3). She did return, on October 26, to rehearse with Fyffe for a promotional radio broadcast they would perform in Perth the next day (The Citizen, 2 November 1946, 5). Roc again posed for press photographs and conducted a further interview in which she claimed that The Brothers was her best film (Dundee Courier. October 28, 1946. 3). These brief visits created plenty of publicity for The Brothers within Scotland. Much of the publicity for The Brothers stressed the film’s Scottish roots, a Scottish story filmed in Scotland with a mostly Scottish cast. Yet, Roc was an English outlier, a fact made obvious when she was forced to admit in her interview that she could not produce an authentic Scottish accent for the film and used an Irish one instead (Dundee Courier. July 30, 1946. 3). Roc’s visits were meant to compensate for her ‘foreignness’ in the eyes of Scottish audiences. They gave her an opportunity to express her newfound love of the country and its people, and be photographed with the Scottish icons that resided within St Andrews. Roc’s visits helped bring her the attention of the Scottish public, and St Andrews became a place where she could embrace Scottish culture and heritage in order to promote her role in a Scottish film. Patricia Roc did not visit St Andrews to play golf, but instead used the instantly recognisable sights and celebrities within the town to position herself within a particular vision of Scotland and to foster good will amongst the Scottish audience targeted by her film, The Brothers. This somewhat unusual purpose illustrates a particular role that St Andrews once played within Britain’s star culture, as a star publicly visited St Andrews as a means to adapt her thoroughly English image. Maximillien De Lafayette, World Cinema: The Greatest Actresses of All Time: Goddesses, Divas, Femmes Fatales, Legends, Mega Stars. Vol. 2. (New York, London: Times Square Press, 2011). ‘Scots Accent Beat Film Star’, Dundee Courier. July 30, 1946. 3. ‘Putting Scotland on the Film Map’, Dundee Courier. October 28, 1946. 3. ‘Film Personalities in St Andrews’, St Andrews Citizen. August 3, 1946. 5. ‘Film Company at St Andrews’, St Andrews Citizen. November 2, 1946. 5.